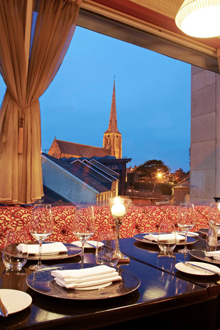 Our rooftop restaurant called the Spires offers panoramic views of Wexford Town. This room is an ideal private dining room for that special celebration, be it a family get together, themed event or a launch party to remember. The Spires can accommodate up to 50 guests for a sit down affair. A min number of 35 guests is required. We cater for all your needs and present menu options to delight all your guests and we are more than happy to create bespoke packages for you. Thinking of having a small, intimate wedding reception? Give us a call to see what we can offer you and your guests. If you would like to make a reservation please use our online reservation booking form.